The new model in the Boxster and Cayman ranges combines the 220 kW (300 PS; 718 Cayman T: Fuel consumption combined 8.1-7 9 l/100 km; CO2emissions combined 186-180 g/km; 718 Boxster T: Fuel consumption combined 8.2-7.9 l/100 km; CO2emissions combined 187-181 g/km) turbo four-cylinder flat engine with a particularly emotional Porsche driving experience. The high-performance character of the T models is emphasised by an extensive equipment package, which includes 20-inch alloy wheels, the PASM sports chassis lowered by 20 millimetres – which is being offered in combination with the 2.0-litre turbocharged engine for the first time in this range – the shortened gearshift, on which the gears are emblazoned in red, and the Sport Chrono package. These features can only be enjoyed in combination with the basic engine in the 718 T. Porsche is offering both the Boxster and Cayman variants with six-speed gearbox and Porsche Torque Vectoring (PTV), including mechanical rear axle differential locking. Porsche dual-clutch transmission (PDK) is also available as an option. Traditionally, “T” stands for “Touring”in Porsche models, and is synonymous with driving pleasure in its purest form. The 718 T will be most at home on winding country roads, offering the joy of dynamic driving as its ultimate goal. The two-seater accommodates this philosophy through a pared down range of features. 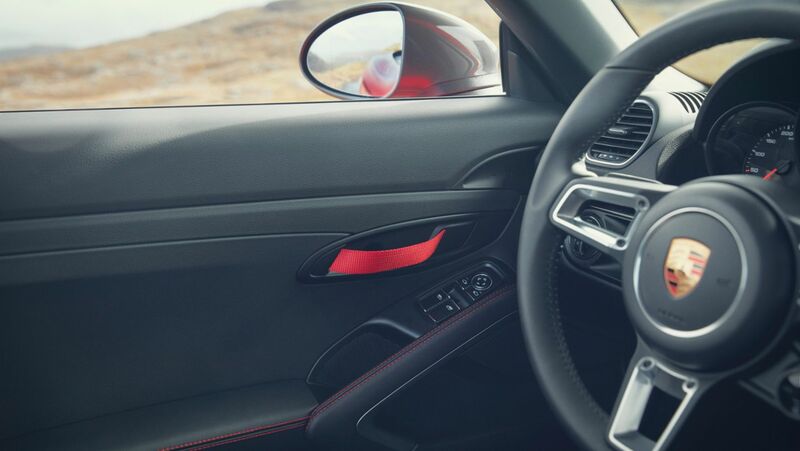 These include black door pulls in the door panels and sports seats with electric two-way adjustment, black Sport-Tex centre sections and the “718” logo embroidered on the headrests. The Porsche Communication Management (PCM) module has also been replaced by a large storage compartment, though buyers who do not wish to forego the entertainment system may order it at no extra charge. Put together, these measures balance out the additional weight created by the installation of the gasoline particulate filter (GPF). In the interior, the character of the 718 T is highlighted through a number of emphatically sporty touches: luxurious padding and leather covering means the convenient, 360-millimetre GT sports steering wheel with Mode switch offers a particularly secure grip. Other “Boxster T” or “Cayman T” logos adorn the black instrument dials. The decorative trims of the instrument panel and central console gleam in a glossy black finish. “Boxster T” or “Cayman T” logos also appear on the door entry strips. The exterior of the Porsche 718 T is characterised by its powerful appearance. With 20-inch alloy wheels painted in high-gloss titanium grey, combined with the PASM sports chassis with 20-millimetre lowered body, it simply looks outstanding on the road. Agate grey mirror shells and “718 Boxster T” or “718 Cayman T” logos on the sides declare the model variant, which can also be identified from the rear, by the centrally positioned sports exhaust with black, chrome-plated twin tailpipes. In terms of exterior colours, buyers can choose from black, Indian Red, Racing Yellow and white as well as Carrara White, Deep Black and GT Silver metallic colours. Porsche is also offering Lava Orange and Miami Blue as special colours. Adjusted for equipment, 718 T buyers can enjoy a price advantage of 5 – 10% compared to a similarly equipped basic model. The 220 kW (300 PS) turbocharged flat engine accelerates the Porsche 718 T powerfully and boasts up to 7,500 revolutions. The 2.0-litre four-cylinder turbo engine reaches its maximum torque of 380 Nm at 2,150/min and has an unladen weight of 1,350 (PDK: 1,380) kilograms. Thanks to a weight-to-power ratio of 4.5 (4.6) kg/PS, it can accelerate from zero to 100 km/h in 5.1 (4.7) seconds. The vehicle’s top speed is 275 km/h. The Sport Chrono package, included as standard for the 718 T, offers Normal, Sport, Sport Plus and Individual driving modes, which can be selected using the Mode switch on the steering wheel. Sport and Sport Plus activate sportier characteristics in both the engine management system and the accelerator, with the automatic dual-clutch function supporting you as you move down the gears in the manual transmission. Sport Plus further hones the handling of the 718 T by ensuring sportier configuration of the Porsche Active Suspension Management (PASM), Porsche Active Drivetrain Mounts (PADM) adaptive body positioning and the optional Porsche dual-clutch transmission. In combination with PDK, the Launch Control function and the Sport Response button in the centre of the Mode switch are also available for use. One special feature of this model is its dynamic gearbox mount –the PADM system, which minimises vibrations in the engine/gearbox area and reduces movements that could affect driving dynamics as a result of the total mass of the drivetrain. This combines the advantages of hard and soft gearbox mounts: driving behaviour becomes noticeably more precise and stable during changes in load and on fast curves. Driving comfort is unaffected on uneven roads. Porsche is expanding its mid-engine range with the new 718 Boxster GTS and 718 Cayman GTS. 20 years after the first Boxster made its debut, Porsche is restructuring its mid-engine roadsters. The redeveloped generation of the mid-engine sport coupé.